These are true statements from committed, church-going Christians. Interestingly, these same individuals also believe intellectually that God is good, loving, full of grace, and mercy. Is it possible for their private images of God to be in direct conflict with their intellectual convictions about God? Yes. I know this to be true because I too have struggled with this internal conflict. In fact, I think it’s more common than we dare to admit. Over the past few weeks, I’ve been exploring overlooked reasons that Christians don’t read their Bible. A flawed image of God will affect our commitment to reading the Bible. What we imagine when we picture God is akin to whether or not we consider Him as worth knowing. Think about it. If we see God as rule maker who is never satisfied, always looking for reasons to punish us—then it’s no wonder His followers don’t rush to His Word as a source of comfort, direction, and identity. Our image of God is different from our ideas about God. Images are pictures we hold in our mind’s eye. They are a powerful combination of thoughts and feelings. Before we were able to think in words, we thought in images. From infancy, we began storing memories and emotional experiences. These images are how we learned about the world around us and ourselves—whether negatively or positively. We store images that help construct in our minds who we believe we are, our value, and self-worth. The trouble is these negative images and thought patterns interfere with our true identity in Christ and can affect how we view God as well. I have found that in order to get a more accurate view of God, I needed to have a more accurate view of how God sees me. But in order to do that, I needed to identify the negative thoughts or images. God’s Word is how we change those negative neuropathways in our brain. Remember to take the negative thought captive first, then counter it with the truth of God’s Word. Below is the list of scripture taken from Priscilla Shirer’s study on The Amor Of God. Please feel free to print, copy and duplicate this list! Repeat it, rehearse it and remember it. THIS is who you are in Christ! This is what God thinks of you. As you begin to put off the old images and thoughts about yourself and replace them with God’s, you will also begin to see HIM more accurately. I am known, chosen, redeemed, forgiven, fearfully and wonderfully made, adopted into the family of God. Click HERE to receive a periodic newsletter with fun tips and news on upcoming books! Great job on your first video. Good info and illustrations. Beckie, your video was wonderful!!! Yes, we need to take those negative thoughts captive and submit them to Jesus, because as you said, we can’t carry old baggage around when He is waiting to make us entirely new creatures in Him. Thanks so much for the marvelous inspiration today! Martha, I cannot thank you enough for your positive feedback. I was stepping out of my comfort zone with this one, for sure! My hope is to help others see how much they are loved by Jesus and get rid of “stinkin’ thinkin’! Wow this is so incredible. I love how you brought together psychology and theology. You broke it down in such a relational way , I love this post! Neli, I’m so glad it was helpful and relatable. Thanks for commenting. May God bless you! Beckie, the Armor of God study is wonderful!!! I just finished it and was blessed and challenged in so many ways. Our thoughts and the words that we speak to ourselves have huge impact, especially if they flow out of a flawed image of God. Thank you for this wonderful post. Congrats on your first video!!! Leah, Thanks for commenting and for the opportunity to link up to the Loft. Blessings! Great post and video, Beckie. 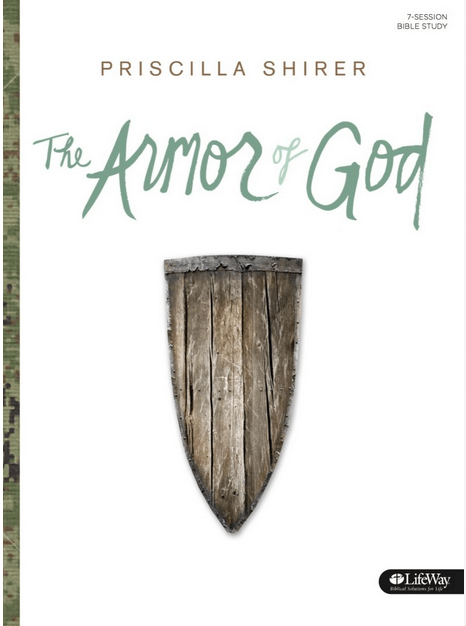 Our ladies completed Armor of God study earlier this year. It’s powerful and so are your thoughts. The enemy’s negative words and our own inside chatter can take up residence in our thought patterns and set up home in our minds. Only God’s Word can tear them down and replace the decor and wall paper. Love your hand motions too. Thank you. Patti, thanks for mentioning how many relate their view of God to their earthly fathers. I appreciate your words of encouragement, sister. As far as the video goes: well, let’s just say, it was my first one! Glad you found it helpful. Beckie, this is very good. As Joyce Meyer says, “The battlefield really is in the mind.” The Lord has been teaching me to apply Philippians 4:8, “whatsoever things are lovely and pure and noble and worthy of praise, think on those things and the peace of God will be with me” (very paraphrased). Otherwise I spiral downward quickly into the pit of stinkin’ thinkin’. You did an awesome job on your video! You go girl 🙂 What device did you use to make your recording? Nan, I too love Philippians 4:8. I used my iPhone for the recording, Thanks for your encouragement! I think you’ve hit on an important truth here. When we don’t have a good understanding of who God is, we can’t relate to him as we should. I think this crops up often when people have bad relationships with their own fathers, but it can show up in other ways as well. As you’ve said, we need to hold up our thoughts to the plumb line of Scripture so we can understand truth. Leigh, Yes! I agree with you about scripture being our “plumb line”. Thanks for sharing your encouraging thoughts.